In May 2017 we went to Vizag. For Krishnan and I Vizag has special memories as I was working with NIIT Vizag at the time that we met and fell in love. We have spent many hours sitting at the beach and Krishnan’s birthday in 1990 was celebrated at Hotel Dasapalla in Vizag. In 1990, Vizag was a small city and quite dirty but we didn’t know better and didn’t mind all the dirt. As the years went by and the plastic bag invasion happened every city in India got dirtier and filthier and Vizag was no exception. When we drove into Vizag in May 2017, we were struck by how clean the city was. As we drove around the city meeting friends and NGO partners and reliving some of our memorable moments we continued to be amazed at how clean the city was. When I remarked about the cleanliness to one of our partners, he immediately pointed out the fact that Vizag was vying for the top spot in India as the cleanest city !! Wowww and more …. The Swachh Bharat campaign has indeed worked. Read more about our visit on this blog – Postcards from Vizag. Cut to May 2018. We are again on our ShikshaDaan Yatra and we started with Lucknow, then to Allahabad and Varanasi and have reached Patna on the 21st. This is my first visit to Patna. Krishnan has travelled many times to Patna for work. While we both marvelled at the road infrastructure and the expansion of Patna as a city under Mr. Nitish Kumar, we are deeply disappointed and actually angry that Patna is vying for the dirtiest city tag !! Its almost as if the entire city is living within garbage mounds. The plastic bag invasion has truly arrived with every item getting wrapped in a plastic bag. While we have been carrying our cloth bags everywhere, every single vendor and shopkeeper reaches for a plastic bag on auto reflex. They are surprised when we refuse to take the plastic bags ! You have cows eating plastic…. and I shudder to think about plastic entering our systems through the milk. Every vacant plot is a garbage dump exactly like Chennai. “Singara” Chennai is giving way to “Kuppaikara” Chennai…. :(. 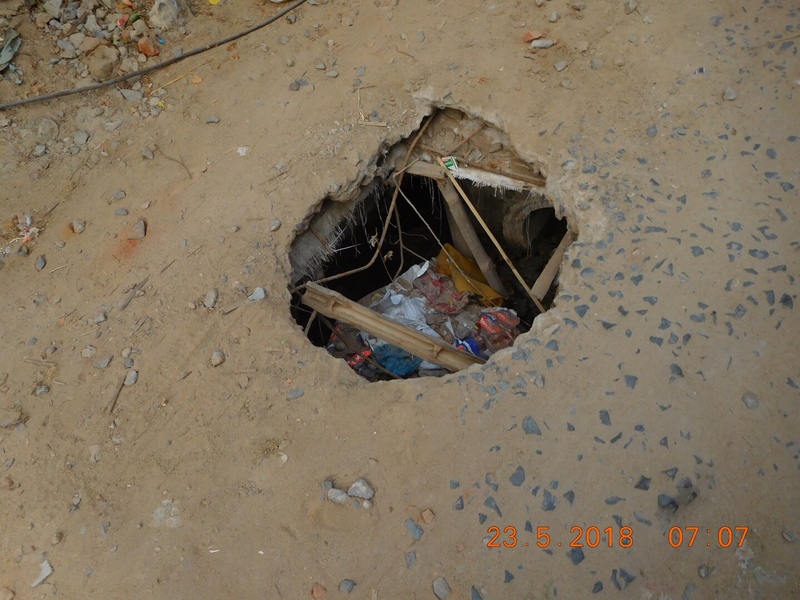 Identify this ….. it isn’t a pothole but a manhole bang in the middle of a narrow street which is used by children, cyclists, motorcyclists to criss-cross between schools and the market place. If a child were to fall into it, there is little hope that it would survive and if a cycle or motorcycle were to accidentally go over it at a slightly higher speed, the rider would definitely fall. Aren’t the residents even concerned ?? Is it too much to seal this manhole with a slab of wood atleast or demand the local municipal corporation to put a lid on it. There are two of these on the same street besides many others on many other streets. Unbelievable apathy. Its almost as if people relish living in garbage and haven’t heard of “Swachhta” (Cleanliness). A Hanuman temple amidst garbage. I am sure Hanuman ji wrinkled his nose and escaped to a Himalayan cave long back. How can anyone live like this ?? 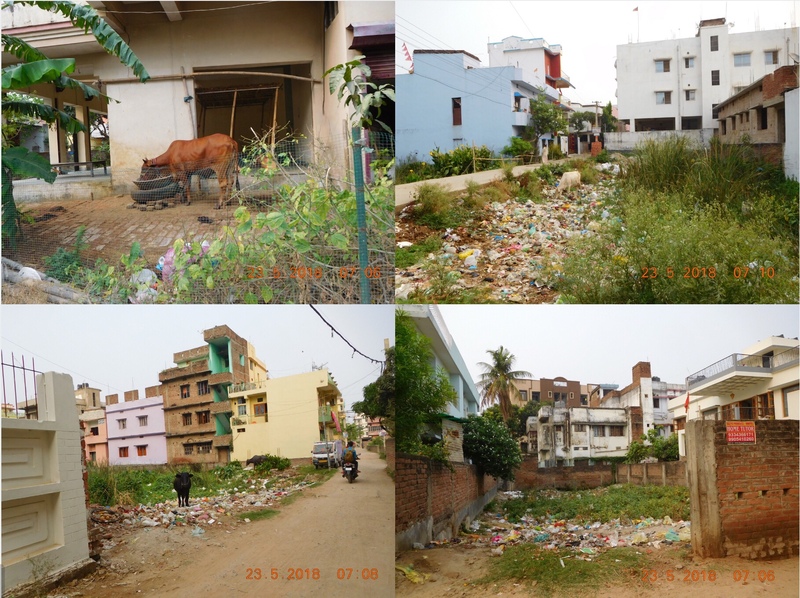 As a comparison – Varanasi in 2011 was filthier than Patna and it was thousands of years of garbage. Today its a remarkable transformation – a lot cleaner and efforts are on to make it even more cleaner, no garbage mounds and the ghats are truly CLEAN. Mr. Modi should be re-elected for two more terms just for the change he has brought in Varanasi. Yes there are open drains and paan stains still but there are also efforts on to close those drains. The number of public toilets that are clean is mind boggling – every street in Varanasi has one. Its truly remarkable. A heartfelt request to Mr. Nitish Kumar – you have done a lot for Bihar. Please get it cleaned up as well. That will be your true legacy. You have rid the state of Lalu – the King of corruption, now rid the state of Garbage.